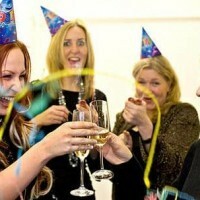 exhibition, product launch or simply just needs cheering up, we have the right party for you. 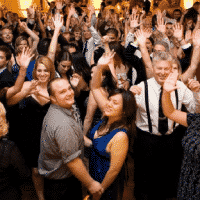 With many years of experience in Corporate Mobile Disco entertainment and many satisfied corporate clients, we will ensure your event is enjoyed from the post room to the board room. If you are an Event Organiser or venue Banqueting Manager, you probably have enough to think about during the festive season, without having to worry about whether or not your DJ will be reliable, or indeed even show up! Nor do you want to put all your eggs in one basket and risk booking your Christmas entertainment with a “one man band” DJ, who may let you down at the last minute, become stale or go sick half way through December! 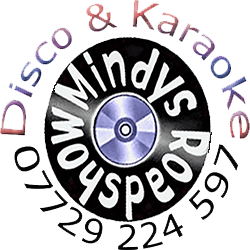 Here are just a few reasons why you should book your company function with Mindy’s Roadshow, an established professional DJ company. 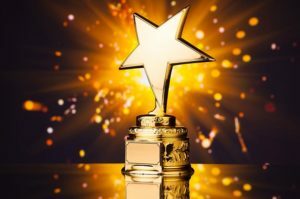 * A dedicated Account Manager, who will meet you at your venue ( if you want us to… otherwise we can take your booking via E mail or phone) to discuss your entertainment requirements and put together a bespoke tariff, tailored to your exact specifications. * A team of regular, professional, DJs – all smart, polite and highly experienced in the corporate sector, whom will understand and work with you, to your high standards. Most clients like to be allocated a small team of DJs to work with throughout December, to build a relationship and keep the nights fresh. * Assured client confidentiality – none of our representatives will ever discuss fees or booking information with your clients or guests. 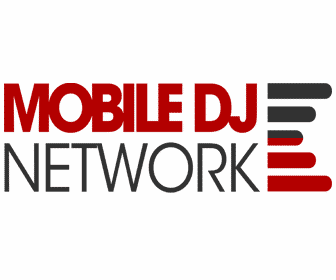 * In addition to music requests from guests on the evening, we offer a facility for your clients to submit a play list in advance of your event, enabling the DJ to prepare prior to the evening. This is particularly useful for themed nights. * We also have a free service whereby if you or your guests wanted to bring along their iphones, ipods or CDs on the night, we can play tracks from these, too. * Incentives are also available in respect of volume bookings achieved in December. These can be discussed with your Account Manager if and when they visit you. Please don’t hesitate in contacting us for a tailor made quote BY FILLING IN THE CONTACT FORM ON THE RIGHT HAND SIDE OF THIS PAGE TOWARDS THE TOP, or Call 07729 224 597. 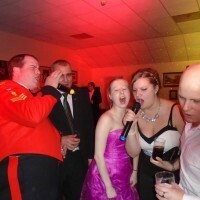 We thought it would be a good idea to offer Karaoke Disco as well a a mobile disco. It can be a good idea starting the night off with a disco, then moving on to the karaoke disco a little later on, as sometimes people need a little Dutch courage to get up on the karaoke microphone…I certainly do. Having said that, I have seen many a person stand up stone cold sober, fun either way I say. So many people have different tastes in music so we had to make library fairly big, with over 15,000 of the top karaoke songs that are available, we aim to please most people. With Legends like Frank Sinatra, Elvis, Bon Jovi, Maddona, then there are all the modern tracks like Bruno Mars, Justin Timberlake, Plus so many more. You might decide to have your disco for most of the evening then switch to the karaoke mobile disco then switch back to the mobile disco. You might want to have the mobile disco karaoke all evening if your friends are all budding top singers, the choice is yours. We use a laptop for karaoke, enabling fast access to your requests. We have a built-in system to save your requests digitally so you don’t have to fill a slip in you can just ask for your chosen karaoke track. You can request more than one microphone up to two, enabling more than one singer to sing at once. Viewing your words on a one-meter square screen via a projector (space permitting), also we can connect to your TV which is the choice for anyone that wants to have the words displayed on the club or pub TV. This ensures everyone sees the words and can join in, elevating the party atmosphere. Karaoke is really good fun, if you can or cannot sing, usually, everyone will join in and sing with you. You can contact us BY FILLING IN THE CONTACT FORM ON THE RIGHT HAND SIDE TOWARDS THE TOP OF THIS PAGE OR CALL 07729 224 597. 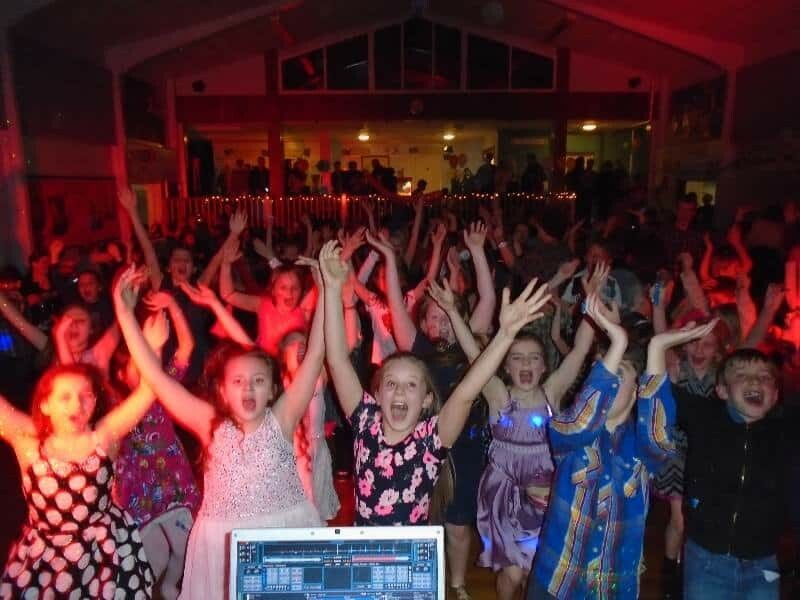 Whether you are planning a Kids Disco or a Child’s Birthday party for 20 at the local church hall, or a High School Disco for an audience of 200, we can supply your requirements, and at our usual competitive price. 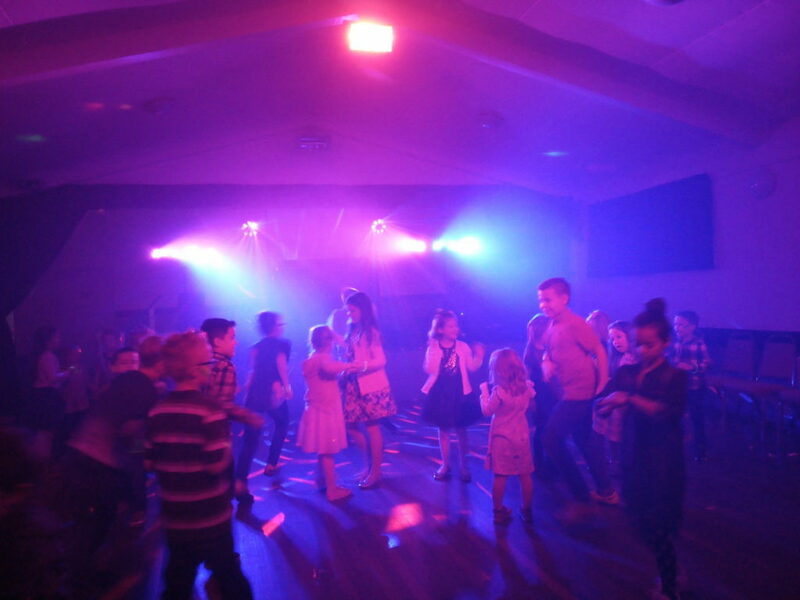 A kids mobile disco for our younger customers is as important as a disco for a wedding and we believe in making it as enjoyable as possible and interact with the children as much as possible. Our discos are aimed at age 5 and over and change the older the children get. and another 45 minutes of fun games and dancing. you do not have to worry about is the children. We will entertain them. As a parent, you will not have to do anything except feed them in middle. We are interactive with the children right from the start and do not just sit there and play music. Games such as musical bumps, statues, chairs are standard as well as some of our own games. keeps them focused as well ( even the boys find this entertaining). When the children are a bit older ( 7 or 8 ) if we feel the kids would like, we then add in teams games like races using balloons and hoops, space permitting. At the magical teenage years the choice of a Disco and its contents get harder, do we still want games? do we just wanna dance to chart music? do we want to have fun and do party dances? the list of questions is endless. The main answer, however, is if you want it we can provide it for you and can make it as fun as you would like it to be. As with our junior disco’s if it’s in the evening especially on a weekend it will be the same price as an adult disco but we will tailor it to your Teens own individual requirements. Unlike our junior disco’s you are not limited to a 2-hour show and you do not have to stop for a food break. 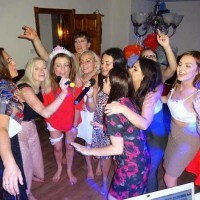 Karaoke can be added on to any of our younger person Discos and can even be booked without a disco. We cater to plenty of schools and Language schools with Karaoke only nights. Our Glow UV Disco Party adds a cool, playful effect to your teenage party. UV (ultra-violet) lights create an ambient purple haze around a darkened venue. White, neon or fluorescent clothing and glow accessories (available as an optional extra please enquire at the time of booking) shine brightly under our UV lighting, which not only looks awesome but is great fun too! Using UV, laser & strobe light-show gives you stunning lighting effects in one fantastic party – UV lights to transform your venue into a glowing wonderland and laser and FX lights for a mini night-club party atmosphere! Why Not Add Snow Effect To Your Children’s Party! Snow machines are one of our most popular special effects. They are very cost effective & produce an amazing effect. Popcorn: Place a number of beanbags, small balls, or cotton balls onto the parachute. Shake to make them pop up like “popcorn”. Making Waves: Children can make small, medium, or large movements to make various types of “waves.” You can incorporate a story about a ship on the sea, weather, etc. &/or use your voice as a tool to emphasize directives. Merry-Go-Round: Children turn their bodies sideways and hold the chute with one hand. They then walk around in a circle, making a “Merry-Go-Round.” For variety, children can hop, skip, jump, etc. You can stop music as a cue to reverse and go the other direction. Poison Snakes: Place three or four jump ropes onto the chute. Shake the parachute to keep the snakes from “biting” (touching) you. Parachute Tag: Lift the parachute high into the air. Call out two children’s names. They must trade empty spots by running under the chute, before it comes down on them. The Wave: Children put their hands up, one after another, in order – creating a synchronized “wave” like in the stands at a baseball game. Rollerball: Try to keep a ball rolling only along the outer edge of the parachute around the circle. As it comes toward you, cooperatively lower your edge. Just past you, raise it. All Change: The Teacher calls out birthday months, pre-assigned numbers, colors, etc, and those children swap places under the chute before it falls, and run to an empty space. See-Saw Pull: From a sitting position, have children pull the parachute back and forth in a cooperative see-saw motion. Shoe Shuffle: Count off. All of a selected number take off one shoe and throw it in the middle. On the count of three, raise the chute, and the designated children have to run under and find their shoe before the chute comes down. Flying Saucer: All take one step forward upon lifting the chute in the air. Upon command, all let go, and watch as it slowly floats. Ball in the Bucket: Break into two or more “teams.” Each team will have a different colored ball (or balls.) They will try to keep their color ball from going into the middle circle, while trying to get the other teams’ color of ball(s) into the hole. Turtle: The parachute becomes a giant turtle shell with everyone underneath it on hands and knees. Everyone must cooperate and work together to get the turtle to move about. Beach Ball Fun: Use a beach ball, moving it with waves, around on the parachute. The Canopy: Squat down with parachute flat on the ground. On the count of three, stand up and stretch arms above head, creating a canopy. Parachute Tag: Lift the parachute high overhead. Call one child’s name and have her run (skip, hop, twirl or crawl) to the other side before the parachute comes down and tags her. Parachute Run: Have the children take turns running on the parachute as it lies on the ground, while the other children make waves. See how long the children can manoeuvre on the waves before falling down. The length of turns can be determined by songs that the children choose to sing (i.e. everyone’s turn lasts the length of one song). This fun party game has been around for years and can be enjoyed equally by children and adults. This is a game that will bring laughter and maybe some tears as you try to limbo lower and lower! Two people hold either end of a two metre length stick at chest height. They should hold the stick in cupped hands, so that it will fall easily if touched. The children take turns going under the stick without touching the stick, bending their knees and leaning as far back as necessay. No hands may touch the floor. This will be easy at first but with each round the stick gets lower. Anyone who falls or touches the ground with their hands is out. All our DJ’s are fully CRB checked. During a weekend it is better to book a party that ends before 4.30pm as many DJs have evening parties to do as well. We can do night time parties for children but they then become priced the same as an adult disco. Please contact us to find out the difference.